The Hollow are stone constructs created by the Wilderking as a form of resurrection. They are unthinking in their duty, and as such they can be encountered as enemies in certain areas. They are considered undead (meaning they are affected by the Fighters Guild skill line) and drop Elemental Essence upon death. 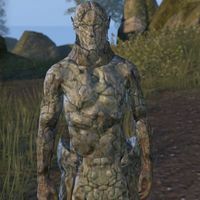 The Hollow all use an Altmer base model and have a stone skin, similar to Fiend Statues. This is because, according to Sumiril's Book, the Hollow were Altmer construction workers that were killed during Ostion and the Valenwood's battle, who later worked together to resurrect them. This page was last modified on 10 March 2018, at 22:38.